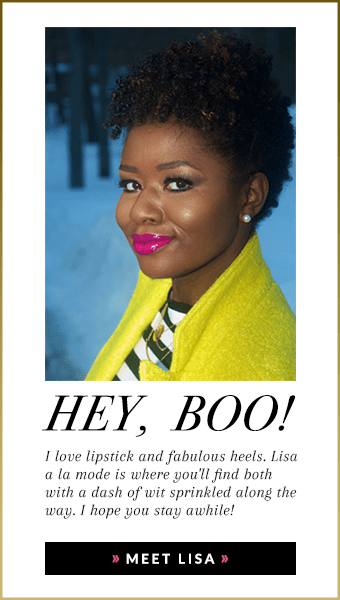 Last year blogger, Awesomely Luvvie (<—click), called out Black Beauty and Fashion bloggers for staying silent on issues involving racial injustice. I found the criticism harsh and unfair. The expectation that black women are required to speak publicly about these issues feels very much like another weight is being placed on our already weighted shoulders. According to Luvvie, even a tweet or IG picture would do, and those of us who remained silent were doing so because we were concerned about our checks. We’re tired of being boxed into what we should or should not be. For me, being traditional in my career pursuits didn’t pan out. I got tired of trying to make myself fit in spaces where I wasn’t wanted. So I created a space of my own. It’s awesome that some of you care to visit this space and occasionally comment or watch my youtube videos, but I’d likely be here without you. This space speaks to my soul. It’s mine. All of it. So I find it particularly disappointing when someone tries to police my space. Luvvie, of all people, should know we aren’t all here for the money, so our silence isn’t necessarily about keeping a cash flow or repping for the brands. Let me be clear: I am a black woman. I have never ever forgotten that I am a black woman, so when the news reports show that one of my own is being treated unjustly I am both outraged and heartbroken, but why am I required to be both things publicly? Before today I have never posted on my blog about the murder of a black person by a police officer. It never felt like the right space, and frankly it made me uncomfortable. I get where Luuvie is coming from, I do. I mean when I see Whoopi Goldberg on TV acting deaf and dumb to racial prejudice and injustice, while having a HUGE platform to speak on our behalf, I am pissed. But we beauty and fashion bloggers don’t have those kinds of platforms, and many of us are just trying to stay afloat and figure this thing out. I’m four years in and I’m still figuring it out! In any event, I say all this to say that Alton Sterling’s death, and the death of so so so many of our people affects us. It affects me. I do not even have the words to fully express what I feel because it feels almost beyond me. Does that make sense? I don’t even know for sure the purpose of this post, but I guess I wanted those of you who do read to know that I do care about more than beauty and fashion, I’m just not much of a social activist. Great job, Lis. I always love reading your words. Just like that, it was posted and I read it. Thank you for sharing your heartfelt concerns from the point of view of a blogger. It does matter and your platform is your own whether it reaches 10 or 10K. God bless and keep your mascara and chin up, Queen!! thank you for reading! I appreciate you! Yes, girl, I hear you and completely understand. I’ve been blogging for 8 yrs and I just don’t do entertainment, politics or current event topics. It never feels right. I’m tired now, though, so a post must be created. Thanks for sharing this Lisa! Everyone deals with thing sin their own way, and because they may not feel the need to be public in their reaction, does not always mean they don’t connect with the situation. We all deal with stuff in our own time and way. Thanks for reading and including me in the conversation. Too many people are focusing on the wrong things.